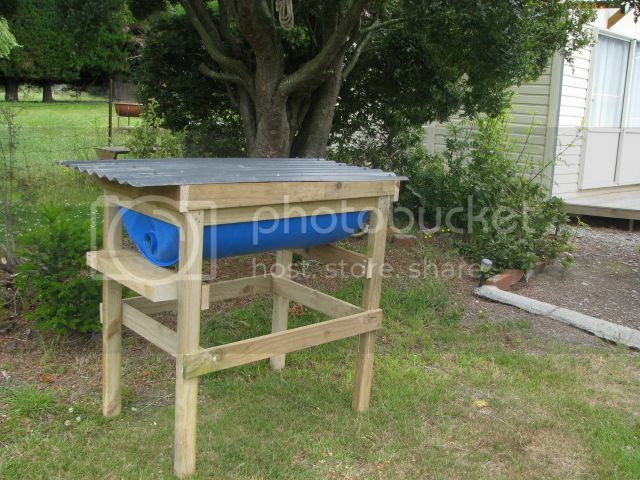 Does anyone have any thoughts or experience with terra cotta clay flower boxes used for top bar hives? I am looking for a woodless option since I live in tropical Mexico... Non treated wood rots very easily, becomes termite infested, and hardwoods are extremely expensive. Also, interested in the future possiblity of glazing the inside to avoid them attaching combs to the sides. I found some that are within the acceptable range of dimensions for a tbh but am hoping for some advise before I move forward. Here's one example I found via Google, i think I'd likely find a large square style if i were going this route, although you could cut top bars to fit in this round one. Best reason for going square is so you could rearrange the comb, 'if needed'. I know i've seen other examples, but i think most were for temporary housing, such as swarm relocation. I believe you could be successful with it long term though. First thing I checked on seeing your post was location" In Mexico should work well though I would want to make sure it was in the shade for much of the day. Here in UK it wouldn't have the insulating properties our bees prefer. Or you could go with something like this. The support frame and roof timbers can be treated, but you would still be looking at untreated top bars. Just make sure the drum you use is food grade plastic. The planters I am hoping to use are rectangular shaped with vertical sides... Like an elongated cube... So more like the expandable and interchangable top bar hives used today without the sloped sides. Thank you for the suggestions, I first considered this method... And still am. But i do not know where to find the food grade ones. Where is their application in the food industry? I would think the surest way to know if the barrel was food grade is if it had food in it. I believe industrial frogs (think hospitals, prisons, anyplace that prepares large quantities of food daily) could be a source but wouldn't know who to contact if I was looking for one. The drum used for the above hive is a UV stabilised Polypropylene food grade item, you do not want to use chemical storage PVC based product. Main supply is manufacturing plants, places where bulk raw product is bought in and mixed to make a further product. Over here they are used a lot to ship dairy products around to various manufacturing plants. Not exactly sure where you might find one in Mexico. Perhaps there is a recycling agency that on-sells once used drums? In regard to your planter rectangles, they sound like they would make great hives with those dimensions. I do not know it would be necessary to coat or treat the inside face, the bees will do that if needed given the time to do so. However the shellac varnish that has been discussed elsewhere might be an option. Any painted on coating would be quick to absorb into the raw terracotta and you perhaps would not get very good coverage per gallon of shellac. An entrance could be made several ways. A slot entrance could be cut with a diamond blade in a 4" angle grinder (wear mask/gloves/safety glasses). Or hole entrances could be cut with either carbide tipped or diamond tipped holesaws. A hammer drill with carbide (masonry) drill bit could be used, but usually these only come in smaller (less than 3/8") diameter, so you might have to drill several holes beside each other to gain a suitable sized entrance. Or... you could "knock" a hole in the tub with a hammer or hammer chisel combination. If the hole ends up too big, epoxy a small piece (or two/three pieces) of 3/4" pipe into the hole created by the hammer. All going well the comb will mimic the interior of the hive- less a bee space dimension at the sides and bottom. Yes you might get attaching brace comb, but you might get that in any hive material. Once the comb gets a little older and has been used a couple of times, they may be less prone to brace it, but in all honesty- brace comb is something you learn to live with and expect- depending on how often you inspect. Serrated bread knives are a good tool for sliding under and down the sides of suspected braced comb before lifting the bar. That planter would be OK but maybe a bit small and prone to swarming. You would really have to remove honey regularly to try and prevent this happening too often. For an opening in your warm climate you could just leave a gap between the first top bar and the end of the hive. I would make sure your lid is insulated and overhangs the hive to shade the sides so they don't heat load during the day. I am not familiar with your climate in South Island, but the way you have that set up at the moment is about right for a slow oven! The corrugated iron will heat up in the sun and prevent bees self-regulating their hive temperature, resulting in a melt-down. You need insulation over the bars, at least, to prevent a melt-down. It would be OK in New Zealand but would need a top entrance and insulation In Mexico. Easy to put insulation in the top frame. Mid summer temperatures here seldom send the mercury over the mid 20's C and there is a 3-5"air gap between the corrugated iron and the top bars. I have built several and no reports of any meltdown's after several seasons since the first was pressed into service. Insulation is added in winter when average temperatures daytime seldom get over 10 C and can fall well into the negatives at night. But yes, if used in more tropical climates, you would need to insulate and ventilate accordingly. The plastic is insect/rot proof though and that was one of the original poster's concerns. You mentioned top entrance for the tropical heat. Can you elaborate on how that is a better setup in the tropics? The top entrances are based on the fact that hot air rises. In hot weather the air at the top do a hive is significantly hotter than at the bottom. We run vents and top entrances in summer to allow this hot air out BUT you have to balance the size of the holes so you don't end up with a wind tunnel. Our top entrances are about 10 x150mm and the bottom entrances about the same. This seems to balance the air movement so the bees are happy in our climate. Now the hot weather is over here we have blocked the top entrances and vents with some hessian sack which leaves the Warre style quilt supplying the ventilation needed. So these top holes are a separate entrance... And do not serve as the only entrance. I still need to drill some bottom entrances? Isn't there a drain hole in he bottom of the planter? That would do but it would be too small on its own. That is where the top entrance comes in. I assumed I would have to screen off the drain hole... This will be my first hive and the first top bar style that I have ever seen in person. All of the models I see on the internet have a side or end entrance with a landing pad near the bottom, and some have screened holes at the top and/or at the bottom depending on the circulation wanted. Will bees find it just as easy to enter through the drain hole and do I need to reduce the size down to a 1" hole? - Put some metal flyscreen over the hole and only use the top entrance. - Let the bees use either entrance. If your area is usually warm (no real winter) then this would be OK. Personally I would be going for option 2. If you have problems with the bottom entrance being too big then just glue a bit of wood over it and drill an appropriately sized hole. Edited to remove double post. Great post -- thank you all for asking/answering. Rob -- do you think a top and bottom should be incorporated for Florida as well? Our winters can get cool, but summers are quite hot, and we just so happened to accidently drill the entrance holes at the top instead of the bottom (we did drill the correct ones, so we have the double set) -- I shall consider that a fortunate error if it means that those holes will provide better ventilation for summer! I would screen them, though -- I live in wasp-land, and we've already had wasps fly directly to the entrance holes with the hive sitting in the garage! First let me say that my conditions are very different to yours apart from the heat. It tends to be dry here with hot summers and cool/cold winters so take this advice as an option only. Top and bottom entrances are no problem on the same hive so long as they are not too big and turn the hive into a wind tunnel. Air movement is good but it must let the bees maintain the hive scent/atmosphere so they can balance things to their needs. Top entrances with metal fly screen stapled on the inside are vents that the bees control. They can use the screen as a matrix for propolis and open and close the vent as needed so a good idea all round. If it turns too cold I just put a bit if hessian in the hole and severely restrict the airflow that way. I would imagine top vents would be good in humid areas as the bees use evaporation to cool the hive and if the air in the hive gets saturated then this does not work and the hive will just heat up. Just find the balance that works for your setup.